One more snowman today and this one is "Carl, the Snowman" from Robyn's Fetish, sponsor this week for the Tuesday Throwdown challenge. 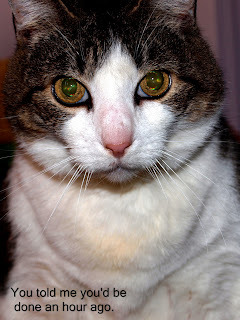 Robyn's graciously supplied images to the DT and Carl was one of my favorites. Our theme is "Celebrate the Season." I took a couple of liberties in that I didn't make a square card and I turned it into a gate-fold. Here's another photo showing it open a bit so you can see the fold. You can also see that I tried to stay as true to the sketch as possible. Today's post is going to be short and sweet so I can take my cold back to bed. :-D More holiday silliness but then, you've come to expect that from my blog, right? Image was a freebie from Limited Runs (I've just recently discovered them!) and I used the sketch from Operation Write Home last week. Colors are from For Your Inspiration. The sketch came from Paper Players. Don't you just love that vintage train, chugging along through the snow with smoke trailing along behind the smokestack? Brrrr, winter is definitely here! It's from Graphics Fairy. 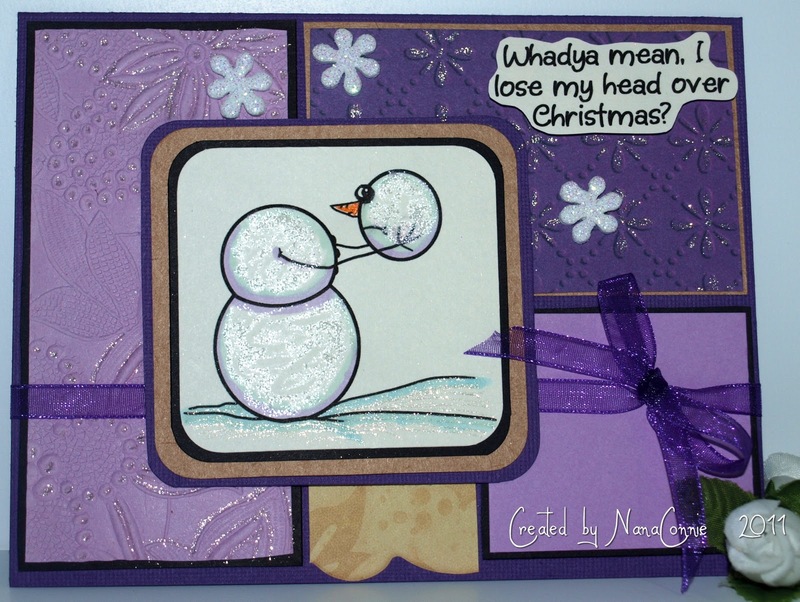 The card is about as CAS as I could get, but I did add the one snowflake which is totally covered in glitter. I also added glitter to the headlamps on the train, and then used Creative Inspirations paints to add some shimmer to the snow, the moon hiding behind the clouds, and the smoke. I wish it showed up better in the photograph. 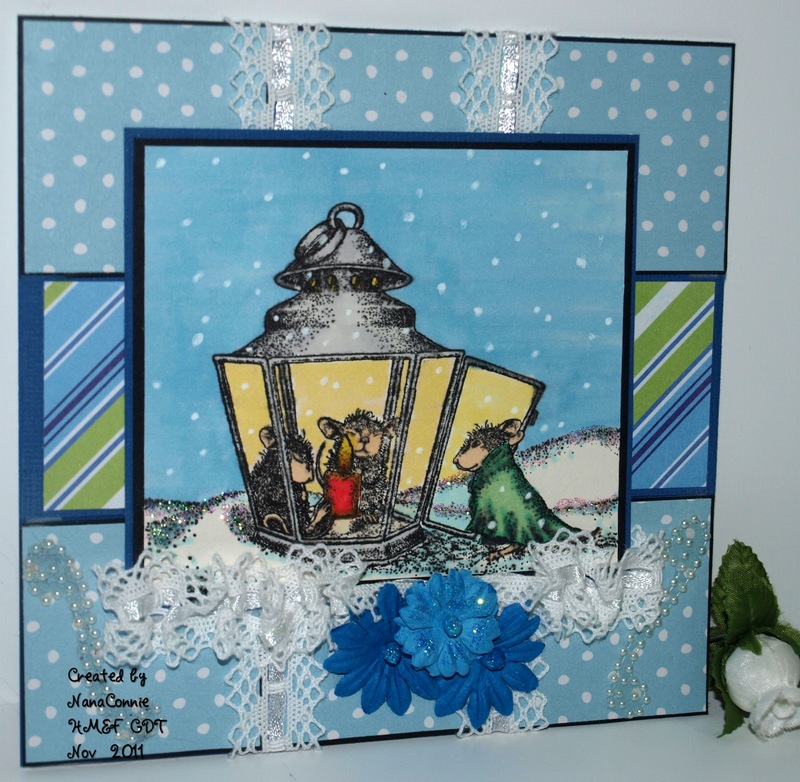 Fashionable Stamping - "Dreaming of a White Christmas"
Another Guest Designer card for House Mouse & Friends. The challenge theme this time is "Warm & Fuzzy." Nothing could be warmer or fuzzier than these little mice huddled around a candle lamp. 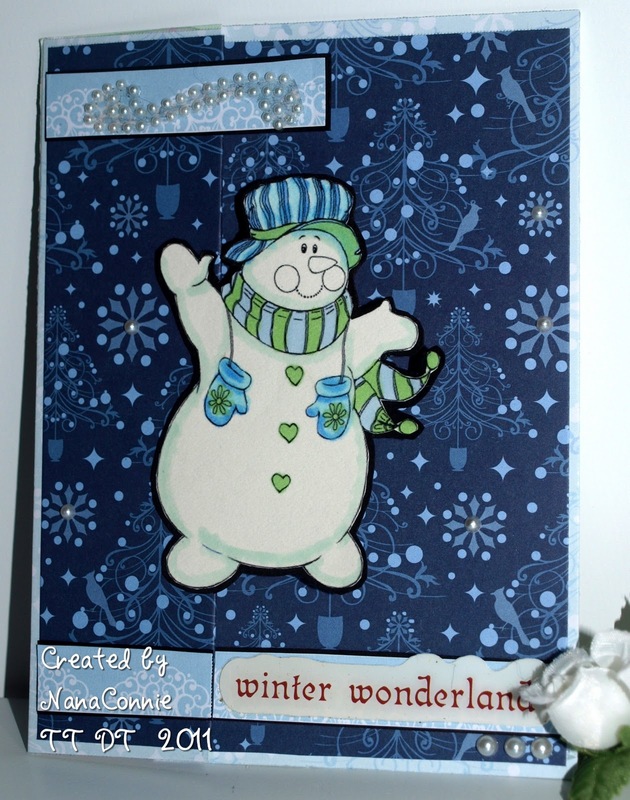 This image is from the House Mouse unmounted stamp set "Winter", and I'm almost ashamed to admit I've never used it before this card. Well, in my defense, I got it after my Christmas/winter cards were done for last year. 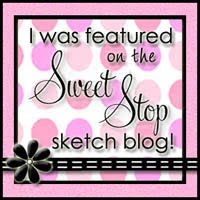 :-D The sketch is from Bling It On. 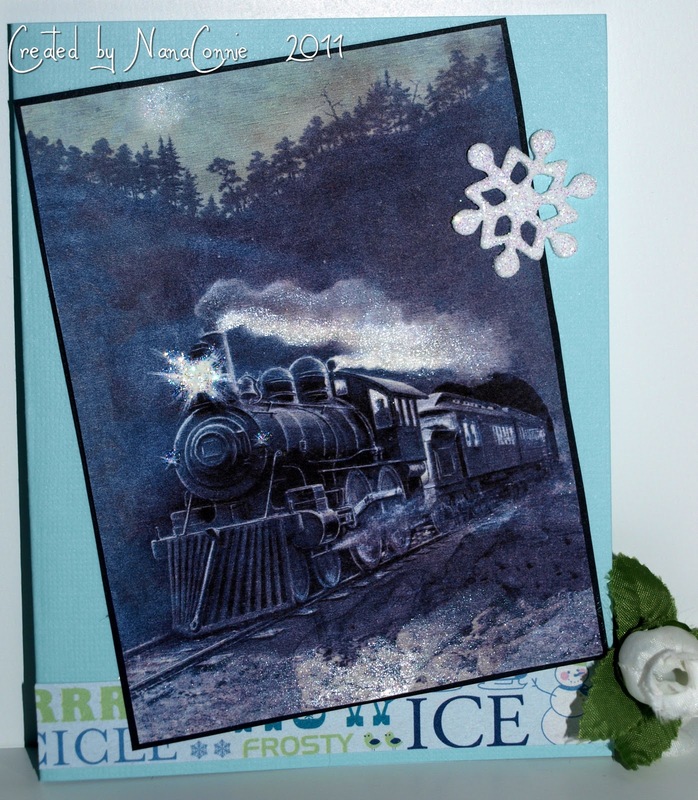 The image is stamped with VersaMark ink and heat embossed with black detail EP, then colored with Copic markers, including the sky, and I used the colorless blender to make the snowflakes, filled in with a white gel pen. 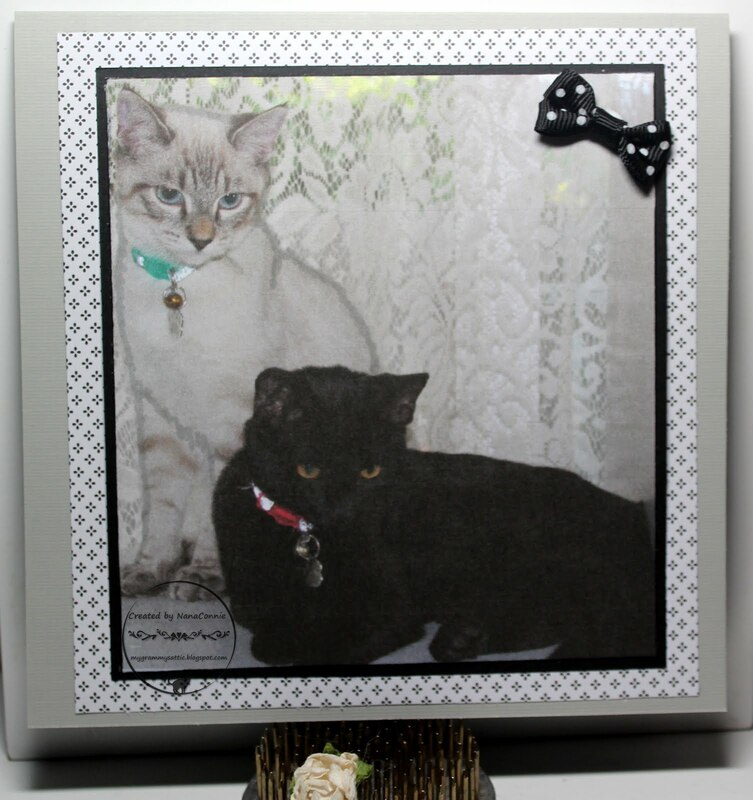 The image is matted with black and dark blue CS, cut with square die cuts. 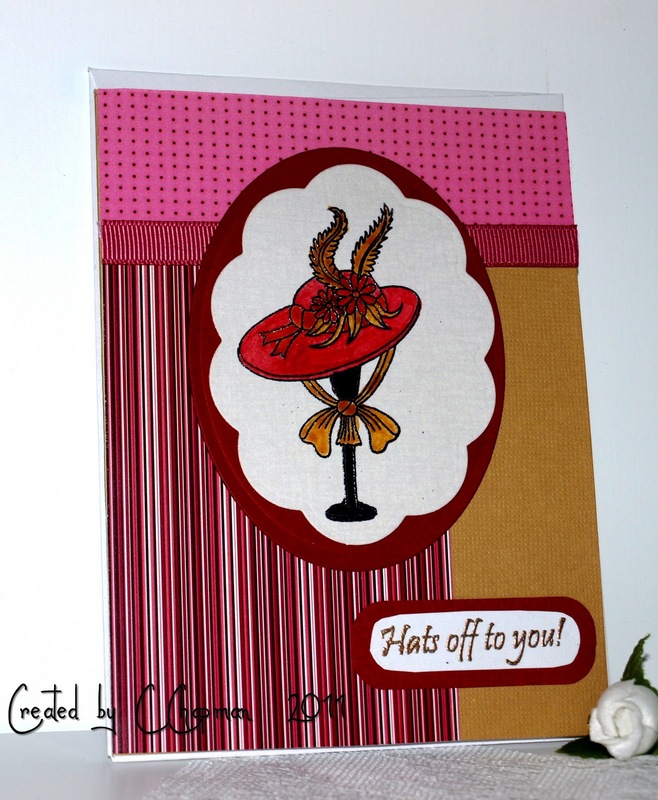 I used polka dot dp and striped dp from DCWV (I think - they've been in my stash a long time!) 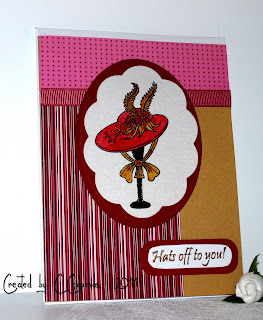 for the background papers and used lace ribbon from Really Reasonable Ribbon to make the vertical lines of the sketch. I added Stickles to the snow and the candle flame. For embellishments, I added more of the lace ribbon, ruffling it along super sticky tape, then added the pearl swirls and the flowers. The flowers also have Stickles on them for glitz and glimmer. Good morning, all my lovely followers and friends. It's a glorious Tuesday morning here in Northern California after a weekend of rain or snow, depending on your elevation. 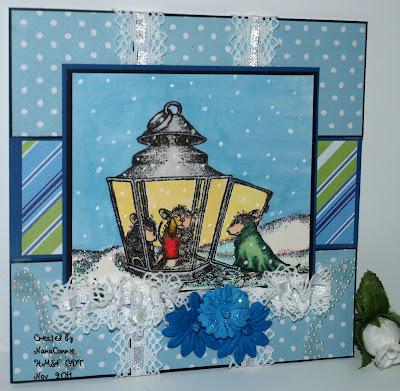 While my own back yard doesn't get snow, after seeing all the beautiful pictures of the fresh snow, today's card is done to celebrate snowy, white Christmases. 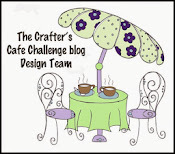 The challenge at Tuesday Throwdown this week is sponsored by Stitchy Bear (they generously supplied all the images to the DT), and our theme is Favorite Color Combo. While most of you know that purple is my favorite color, teal/turquoise and white is one of my favorite color combos for cards. Isn't this the most adorable snowman (hmmm, snowpeople) family, all together for Christmas? The sketch is from Eat, Sleep, Stamp and I had to push it a bit to get the window effect I wanted. 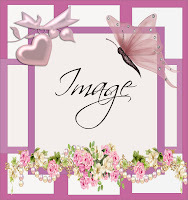 I think Tracy will forgive me for that since square cards and window cards are things I rarely do but I took it as a challenge and did both in one card! Thanks, Tracy, for the inspiration. 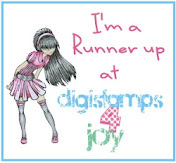 :-D Christmas Stamping All Year Long wants us to use a favorite sketch, and you all know by now that Tracy's Eat, Sleep, Stamp is my favorite place to find a sketch. My final touch was the sparkly gem swirl for some added bling. I have to say this is one of those cards which pleases me greatly! I was a bit concerned that it wouldn't look the way I had it pictured in my mind, but it is even better than what I imagined! 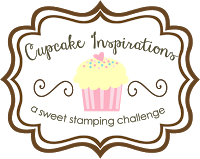 Today's Tuesday Throwdown challenge is sponsored by Catherine Pooler, an independent Stampin' Up dealer. She will be providing the prize for our winner! 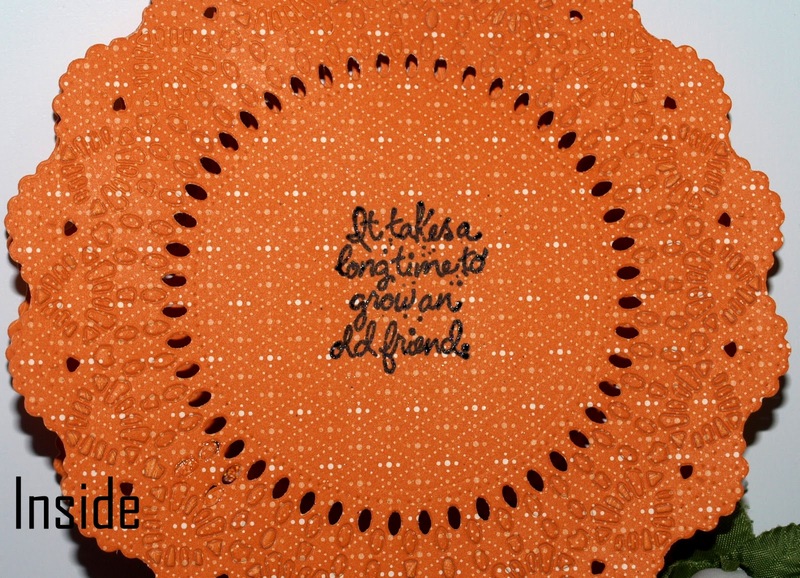 The CS, image, and sentiment for my card are all SU products; the card stock is two-sided, patterned and comes from the Europa collection, called Pumpkin Pie. The image and sentiment are from the Gnomes set, oldies but goodies. I thought this Gnome was perfect for a Halloween/fall card. Who wouldn't want to be a cute gnome at Halloween? I rarely do shaped cards, for two reasons: I don't have many dies really large enough to make a card and I like A2 shaped cards since I do so many cards for Operation Write Home. 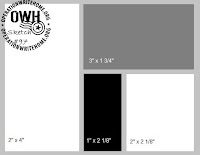 (Please check out the last paragraph of today's posting for more info about OWH.) 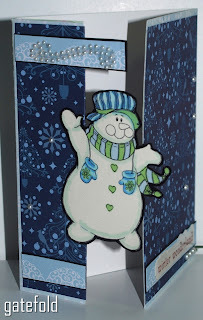 But when I found out that our Tuesday Throwdown challenge was going to be for shaped cards (nothing square or rectangular), I had to figure out what to do! One Stitch at a Time also has a "Shape Up" challenge theme, and Paper Cutz wants us to do "Stars, Circles, or Diamonds." Obviously, mine is the circle, and The Stamp Man theme is "Circle It." Along that same line, Card and Scrap says "Not 4 Sided" and a circle was the first thing that came to mind. 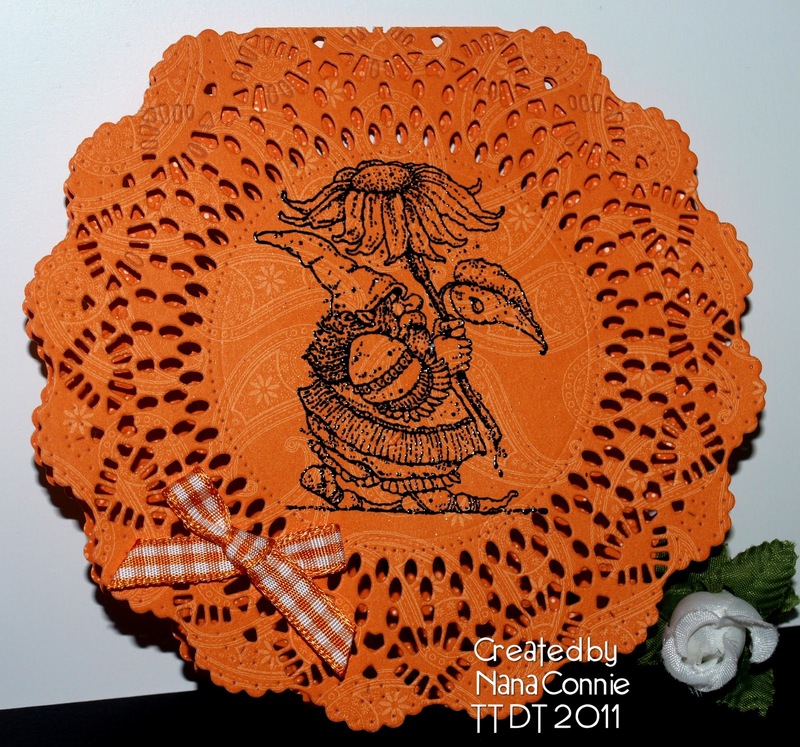 This one is made from a large (5 1/2" diameter) doily die, with the paper folded at the top and the die positioned just below the fold line. 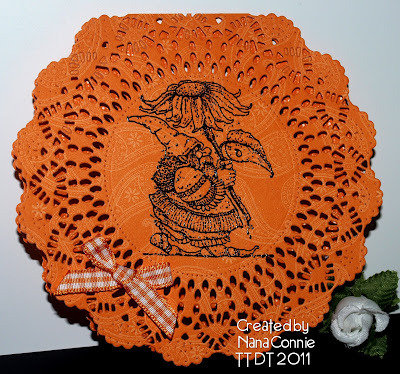 Once the doily was cut, I stamped the Gnome into the middle of it, and heat embossed the image with black, detail EP. I loved the black on orange combination so I did nothing else in the way of coloring him. I did stamp a sentiment on the inside (also heat embossed) and add the orange gingham bow to the front, made from ribbon that came from Really Reasonable Ribbon -- their challenge theme is "Fun 4 Fall". In addition, Meljen's wants us to use ribbon on our projects this week. You can see the other side of the Pumpkin Pie CS in the photo below. Time to talk about all the other challenges, made easy again because of all the fall/autumn colors/Halloween themes this week. 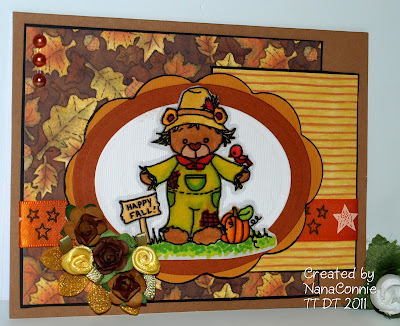 I'll start with Pile It On (Fall is for Fun) because, in addition to their theme each week, they want us to make cards which can be used is as many challenges as possible. I always select my challenges before I start on my cards. That way, I know the card will fit the particular challenge and, if it doesn't when I'm finished, I can eliminate that challenge from the list. I promised you some additional information about Operation Write Home. 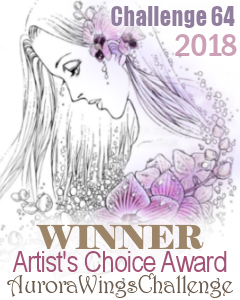 They are a fantastic, non-profit, organization which gathers up donated, hand-made cards for shipment to our deployed military troops that they use to send greetings home. 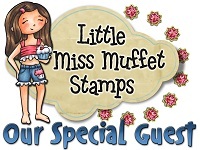 All this week, OWH is being supported by card makers just like you and me, helping them to raise funds for postage. It's going to take more than $13,000 to mail boxes of Christmas and holiday cards to the soldiers overseas just this upcoming season. 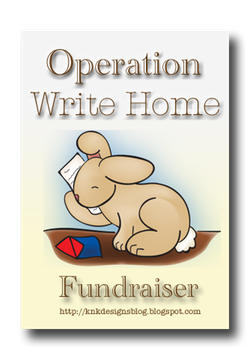 One of the fund-raiser, blog hops will be starting here on my blog this next Friday morning, and featuring some cute and clever digi images which you can buy to help OWH in its cause. All the proceeds (less the Paypal fees) from the digi sales are being donated by the artists to OWH. 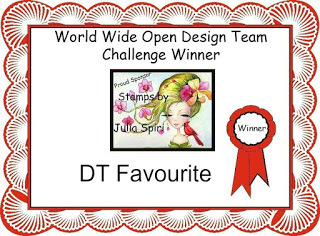 (Our fellow DT teamie, Deedee, is one of the artists! Another is Katlyn of K 'n K Designs. Thank you, Deedee & Katlyn. We love you for doing this!) Please mark your calendar and come by here on Friday. Thanks. 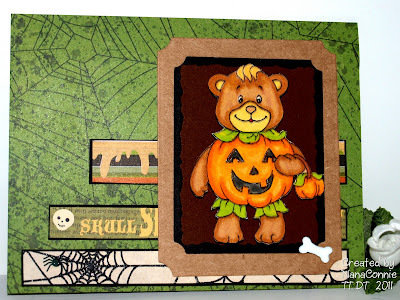 I used "Bearly a Pumpkin" and he's so adorably sweet that I had to use spooky papers and embellies to try to balance the 'Cute' with the 'Spooky'. 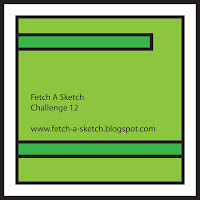 The sketch came from Clearly Inspired Challenges, and I flipped it on its side. Bearly a Pumpkin is colored with Copics and fussy cut very carefully. 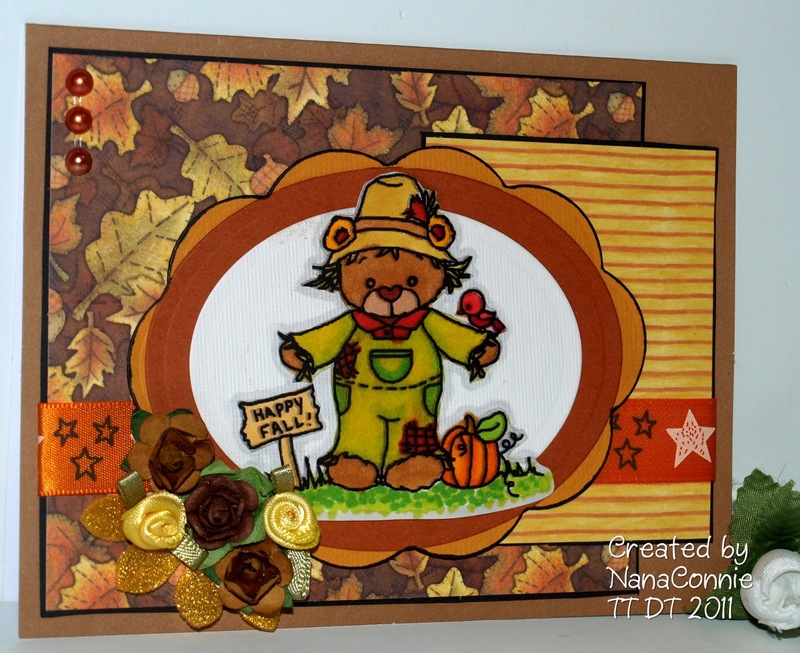 Fabulous Friday (Frosted Designs) has a challenge theme to do fussy cutting. I used three different die cuts, layered together, for the matting behind the image and used Pop Dots to adhere the image to the die cuts. Although it's difficult to see in the photo, the image is almost 1/4 inch above the mat. 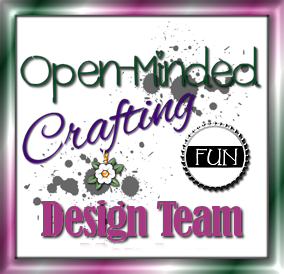 Emerald Faerie Garden asks us to uses die cuts or punches. The dps are all from my stash but they've been around since last year so I have no idea what company made them. I added the bone brad as the only embellishment. I don't think it needed anything more than that. As simple as this design is, can you believe there are 8 layers on this card, not counting the card base? Paper Sundaes wants to see lots of layers this week. 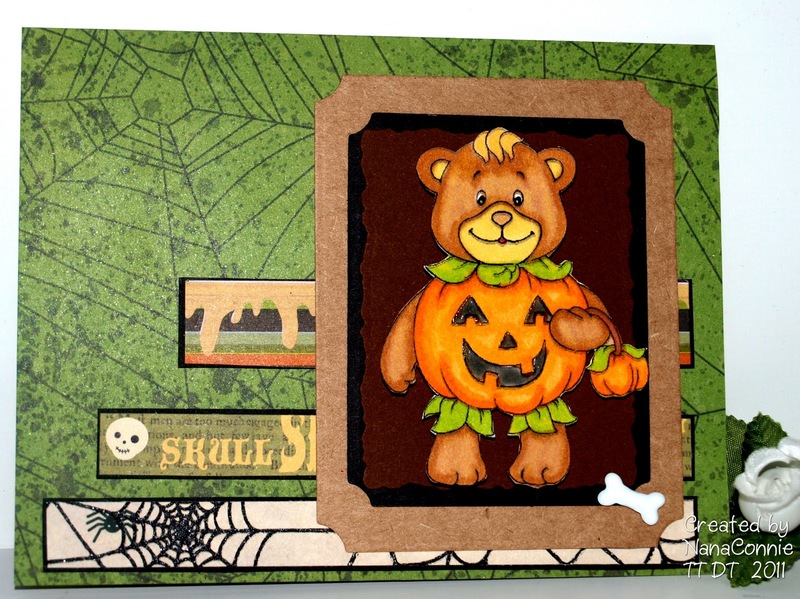 This card will be given to my grandson for Halloween and I know it'll bring a huge smile to his face. Card Cupids is asking us to do a "Random Act of Cardness" for their challenge by making a card and then giving it away to bring joy to another. I love that idea! 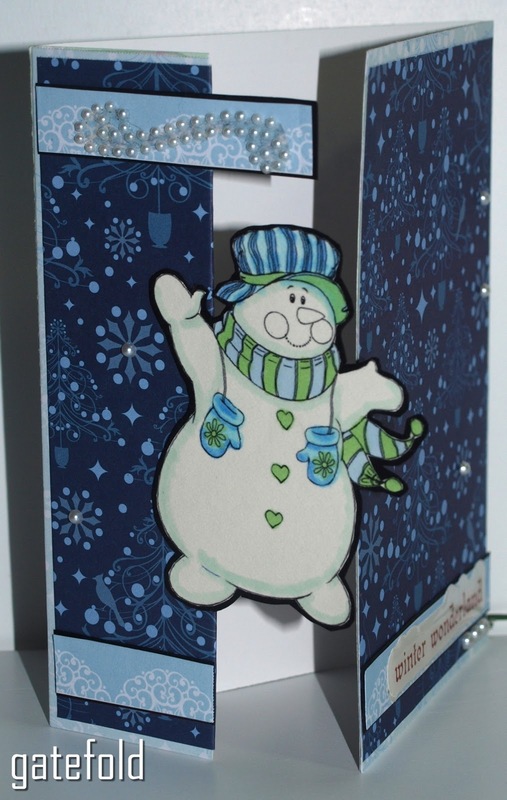 Pile It On - "Do it for fun" and always, work in as many challenges as possible when making your card! Edited to add: This card was featured on The Sweet Stop. It's Tuesday, that old Back-to-Work-Monday is now behind us and it's time for another challenge at Tuesday Throwdown! 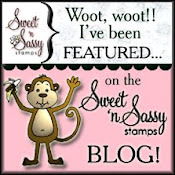 This week we are celebrating "Fall Days" as our theme, and our sponsor is Sweet 'n' Sassy stamps. They have some really wonderful images, and I chose Rubarb Scarecrow. Isn't he a sweetie? 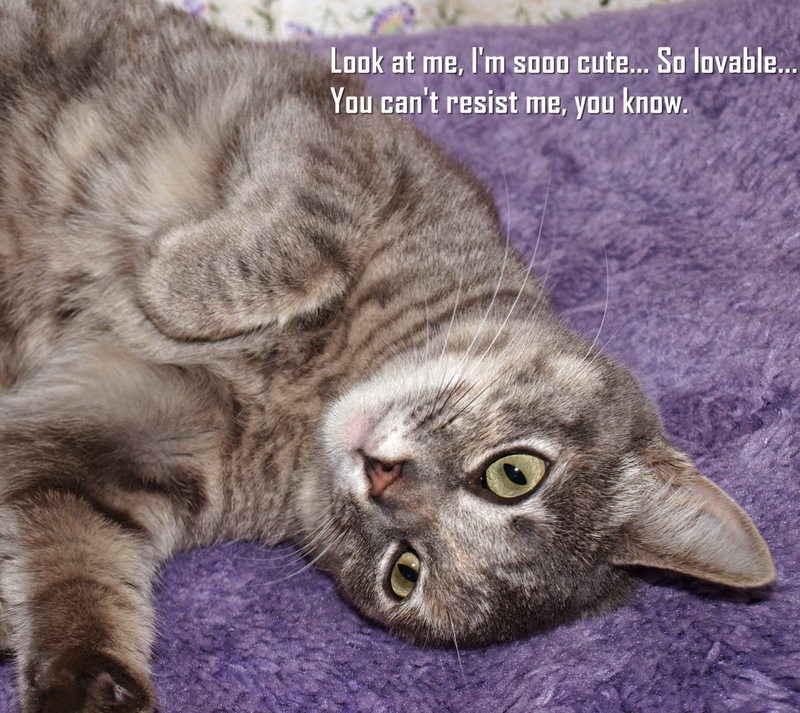 Sweet 'n' Sassy also has a challenge with an inspiration photo this week. You have to go over to the site and check it out, but it has a little girl who seems to be crying out for new toy. I thought Rhubarb in his autumn scarecrow outfit would make a perfect new toy for her! I used a sketch from The Sweet Stop where they also have a spin on it this week -- "Starstruck", which you can interpret any way you like. I chose to add ribbon which had stars in it. The ribbon came from Really Reasonable Ribbon (part of the September monthly ribbon club selections) and they also have an "Autumn" theme for their challenge. 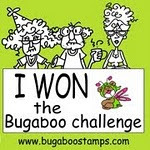 Catch the Bug Challenge wants us to "Make a Scene" and Rhubarb made that one easy! He's a scene all by himself with the pumpkin, the bird and the sign. Crazy 4 Challenges would like us to do projects which have pumpkins on them. 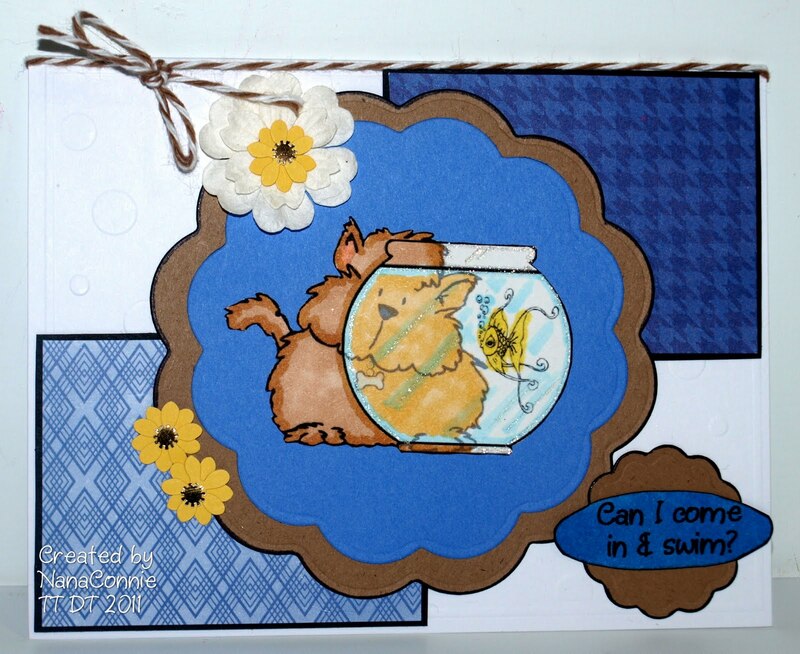 Rhubarb's colored with Copics, then fussy cut and matted with die cuts from Spellbinders. The Corrosive Challenge wants us to use punches or dies. For the colors, of course I used the "Fall Days" theme from here at Tuesday Throwdown, but the following challenges also had us use either specific colors which fit in with fall or autumn colors as their theme: Pile It On (and don't forget they want us to pile on the challenges, too. ), The Ribbon Girl (green and brown), Our Daily Bread (fall colors), Send a Smile for Kids (fall or Halloween cute card). The papers are mostly from DCVW, but have been in my stash more than a year. I'm going to be so sad when that dp with all the leaves and acorns is used up. (sniff) For embellishments, I used the ribbon, the pearls, the paper roses, the ribbon roses, and the yellow foam petals beneath the flowers. Crafty Emma's CES Challenges wants us to "Embellish it more" by using 4 or more different types of embellishments. The Emerald Faerie Garden asks for pearls this week, and Little Miss Muffet wants "Things with Wings" -- the bird. 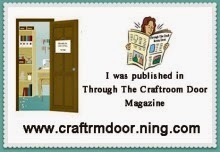 Creative Craft would like us to use something New, and Rhubarb is my new image along with the new ribbon. My Time to Craft wants us to use things starting with the letter "L" and I have done leaves and layers. Di's Digi Designs (a brand new challenge blog) says Anything Goes, and Cardmadfairy wants Lots of Layers (I have ten not counting the embellishment layer.) Finally, Scrappy Frogs (my first time playing over there) wants Vintage. Rhubarb looks just like one of the Halloween post card images that were so popular from the early 1900s through the 1920s. All the roses give him an even more vintage look, I think. I still haven't heard from the part of my family in Virginia but they could be among the nearly 2 million who are without power. I'm keeping them in my prayers. I did chat briefly with another friend who said the only thing they suffered was a missing kitty in the midst of heavy rain. Their daughter went out looking for him as soon as it was safe but before the rain had stopped. Since their daughter is 23, she pretty much knew how to avoid danger but she was so worried about Max she just had to go looking. Yes, she found him. :-) So, this card is for her, and I'll put it in the mail tomorrow. 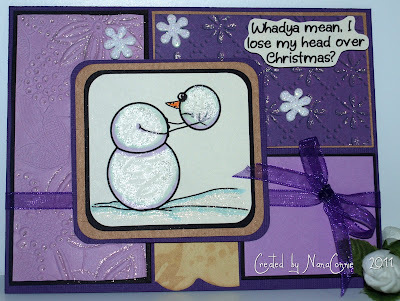 Remember yesterday when I said I'd probably do another card from the inspiration photo at 4 Crafty Chicks? This is it. 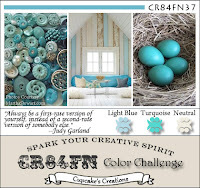 I used a sketch from Fussy and Fancy and colors from CR84FN. Paper Sundaes wants us to use Magnolia stamps this week and my mini Tilda with Umbrella was perfect for searching for a kitty in the rain. She's colored with Copics and matted with sparkly black and turquoise CS. 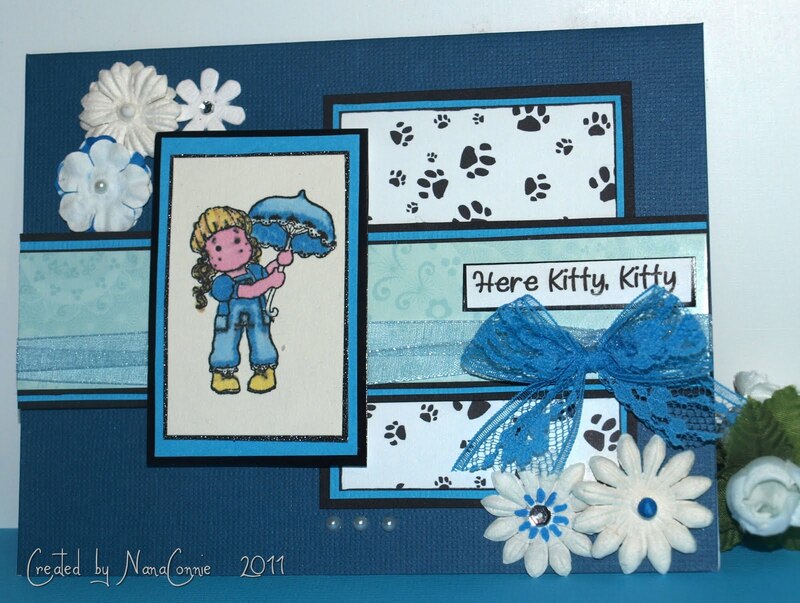 In fact, I used turquoise and black card stocks to mat everything on the card, including the dp strip across the middle and the pawprint digi dp. 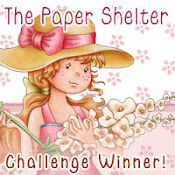 Delightful Challenges asks that we use digital papers this week and, since I had the pawprints, that fit perfectly for their challenge. Each layer (except the pawprint dp) is adhered with pop dots so there's lots of dimension on this card. The bow is tied from lace hem tape and Mark's Finest Papers wants to see lace on our projects. The flowers are all from my stash but I've layered them and added pearls, sequins, stamen, rhinestones, or a bit of color to them. Sentiment is printed with a computer font and the three pearls below the dp were the final touch. Magnolia Down Under wants to see texture this week so I'm submitting this to their challenge also. I adore this card and I know Sandy is going to love it, especially since she found Max. She said he was wet and bedraggled looking but none the worse for wear. He was just glad to be back in the house and out of the weather. I'll bet he thinks twice before running outside again! 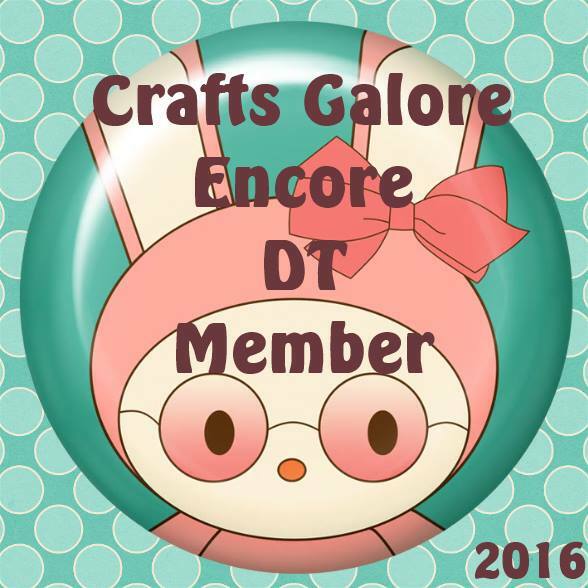 Tuesday Throwdown -- I'm on the DT ! Good morning all my friends and followers. Hope your day is bright and happy. Mine definitely is since this is my first day as a Design Team member at Tuesday Throwdown. :-) You know I'm excited and honored to be part of the new team. The challenge this week is sponsored by McMahon 5 , where you could win a $10 coupon, and the challenge is to use a non-stamped sentiment. The image I used is Dog Watching and I thought he looked like he wanted to join his fish friend and have a cooling swim. The sentiment is my own ("Can I come in & swim?") and, instead of using a stamped sentiment, I printed this one from my computer, using using one of the many handwriting fonts I have. 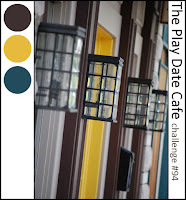 I started with a sketch from Pixie Cottage, and the colors from Play Date Cafe. Do You Stack Up wants to see embossing and I embossed the front of the card base with circles and dots (although it's hard to see in the photo), then added the rectangles of dp (DCWV), which had been matted with black CS. I colored the Dog Watching image with Copic markers and sparkle gel pen on the fishbowl. I fussy cut it and adhered it to a Spellbinders, scalloped circle die cut (blue CS), matted with a larger die cut from kraft CS. I cut a much smaller scalloped circle of kraft CS to mat the sentiment which I had printed and cut into a long, narrow oval. I used a black marker to highlight the outside edges of the large, kraft die cut, the sentiment, and the die cut matting the sentiment. The final touch was the brown twine (The Twinery) around the card front and the flowers. Pixie Cottage wanted us to do their sketch and add some flowers and 4 Crafty Chicks wants us to use twine. I'm thinking male birthdays today because I got a call this morning that my GDIL is in labor and my new great grand should be arriving sometime today. My grandson so wants a boy! They have a little girl, so we're all cheering for a boy this time. Maybe by tomorrow I'll have big news I can share. Anyway, today's card is actually for a friend of mine who's celebrating his 61st. 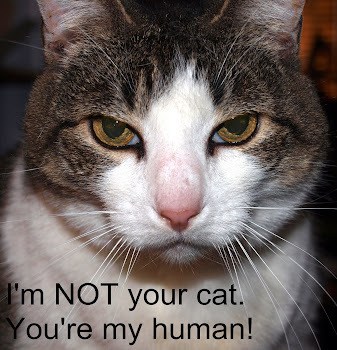 He's not particularly fond of animals, at least not the 'pet' kind, so I thought this sentiment might be fun. The image is from Hambo but I missed the deadline for their progressive challenge. Maybe next week. I used a sketch from Unscripted Sketches. 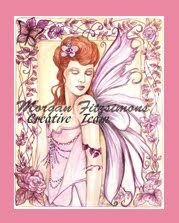 The image is colored lightly with Copic markers, then matted with black CS. Two of the background dps (been in my stash forever!) are also matted with black before being adhered to the card front. The sentiment is printed, then matted in black and layered onto the dp. The only embellishment is the gingham ribbon bow. I like the turquoise and washed denim blues on this card - they make it masculine without making it dark or heavy looking. That cute cat needed something light and busy, since he's rather simple and plain himself. Shopping Our Stash has a challenge of "dogs OR digis OR denim." I did a digi image and denim blue, but that's definitely NOT a dog. :-) Incy Wincy wants to see the Old and the New. The papers are old and the image is a new one for me. 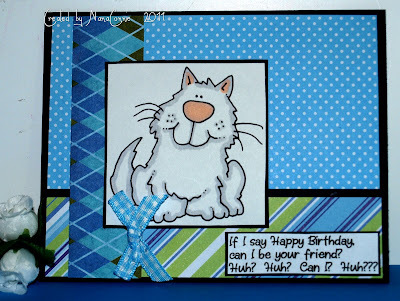 The final two challenges for this card are Top Tip Tuesday for straight edges, no circles, or ovals, and I have a tip to add. 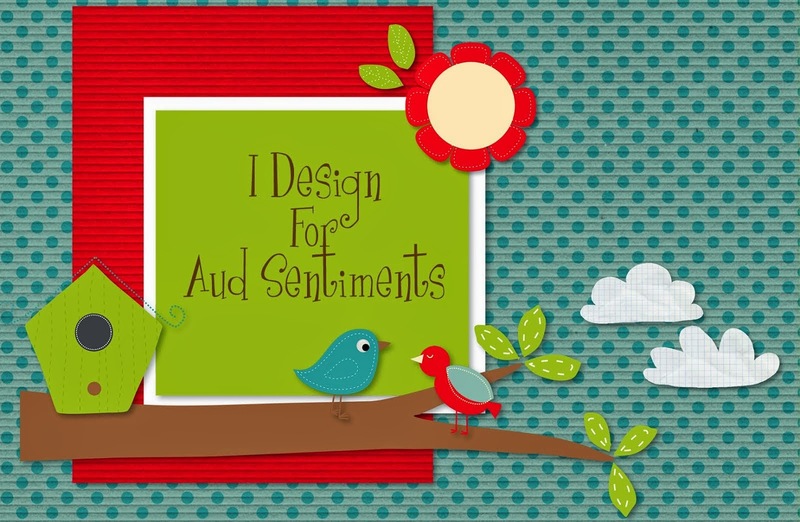 When you have a great sentiment you thought up but don't have a stamp for it, and you don't want to write it in your own handwriting, search for computer fonts that look like handwriting and print the sentiment. There are dozens available out there and many of them are free downloads. Pixie Dust Studio has a challenge of "Boys Will be Boys". Sorry for not having a new card for you this morning but my crafting weekend really didn't go as planned. My daughter and two of my grandkids came up to visit me (with a hidden agenda -- but more about that later in this post) and, as they were leaving town to head back home (250 miles away), they were in a collision which totalled out their vehicle. Other than managable bangs and bruises, daughter and both grandkids are going to be fine. Thank God for that! Somewhat scary and emotional for all of them (me, too!) End result is that I stayed with them as they all got treated at the local ER before being released, and then I drove them home. That was a four+ hour trip each way and, once at their house, I stayed overnight before returning home. OK, now the hidden agenda part-- they brought me a kitten! Honeysuckle (already shortened to "Honey") is a Flame Point Siamese mix, 10 weeks old, a little, white, bundle of purring and energy, and the Cleo Dutchess isn't just sure how to handle having another feline in the house. Once she gets Honey properly schooled in the necessities of the pecking order, and that Cleo is at the top of it, things will be fine. For now, Honey is content to sleep next to me at night, curled up on my pillow with her little face in my hair. 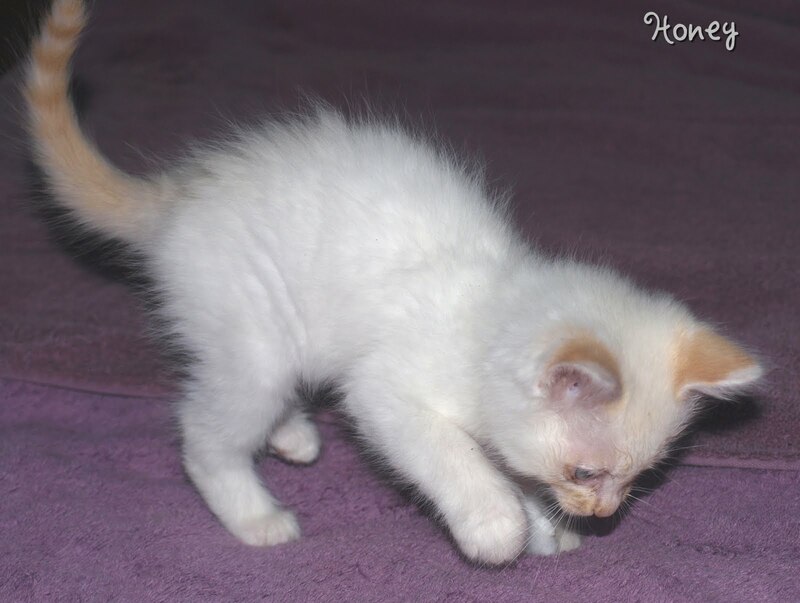 In this first one, Honey is stalking a cotton ball and about to pounce. And in this one, she captures it! What a mighty huntress !! I'll have a posting tomorrow (new Dude Time Doodles challenge coming up!) and should be back on track by the end of the week. Thanks to those of you who had already heard about this and who have sent such wonderful well wishes and prayers for the family. Fortunately, it was only the car which was badly damaged and that can be replaced! Grammy's Chocolate-on-Chocolate, Three Layer Cake ! Earlier this week I mentioned that I was baking a cake and that the recipe came from my Grammy's cook book. I promised that if I had time, I'd post the recipe here -- so this is it. Unfortunately, her dessert baking spoiled me for all other desserts! I've never been much of a cake lover and, this week, I think I discovered why. When I baked the cake with this recipe, it was moist, rich, and decadently chocolate! I didn't cut any corners or take any shortcuts. I did it just the way the recipe said and it was the most wonderful chocolate cake I've eaten in 45 years! Ooops, now you know which generation I have to claim. Atthe end, I'll also give you her recipe for the frosting -- almost like eating fudge! 1. Allow butter and eggs to stand at room temperature for 30 minutes. Lightly grease bottoms of three 8 x 1 1/2-inch, round cake pans. Line bottoms of cake pans with waxed paper. Grease and lightly flour waxed paper and sides of cake pans. 2. Heat oven to 350 degrees. In a medium bowl, stir together the flour, cocoa powder, baking soda, baking powder, and salt; set aside. 3. In a large bowl, beat butter until completely soft. Gradually add sugar, about 1/4 cup at a time, beating until well mixed with no butter lumps. Add eggs, one at a time, stirring thoroughly after each one. Add vanilla and stir in. 4. Alternately add dry ingredients mixture and milk to wet ingredients, stirring and beating thoroughly until well mixed. Mixture should be smooth and creamy, and pourable. Pour equal amounts into each of the cake pans. 6. Frost the top of the first layer before adding second layer. Add second layer and frost the top. Add third layer and frost top and sides of all layers. Add chocolate curls, sliced nuts, coconut shreds, or fresh berries in season to the top as desired. In large saucepan, combine 12 oz baking chocolate and 1/2 Cup butter; heat on stovetop over low heat until melted, stirring often. Let cool for 5 minutes. Stir in 8 oz sour cream. Gradually add 4 1/2 Cups (about 1 pound) of sifted Confectioner's sugar, stirring hard until completely mixed and frosting is smooth. Frosting will be thick but spreadable. This recipe will cover a three layer cake including frosting as filling between the layers. If fruit or other filling is used between the layers, left over frosting can be refrigerated for up to 4 weeks in a sealed container. As promised, here's one of Grammy's favorite cookie receipes. Keep in mind, this goes back many years -- maybe even before I was born and I'm OLD !!! :-) She called them "Old Fashioned Blondies", and they are actually more of a cookie bar. Much faster to make than individual cookies since you bake them all in one pan. The above part was typed onto paper that is now quite yellowed with age, but I can make out the additional notes in her own handwriting. 8 ounces grated baking chocolate for chocolate cookie. 1 cup chopped walnuts (or pecans). 1/4 cup molasses or maple syrup. If either of these are added, reduce the number of eggs to 1. Coat a medium size baking pan with butter, and set aside. In a saucepan, heat the brown sugar and butter, stirring until the mixture bubbles. Remove from stove and let cool slightly, then stir in the eggs one at a time, and add the vanilla. Stir well. Add the sifted flour, the baking powder, and the baking soda. Stir well. Spread the mixture into the coated baking pan. Bake in a 350 degree oven for 25 to 30 minutes or until done. Cut into rectangles while still warm. Add any of the optional ingredients to the mixture before spreading it into the baking pan. Drizzle small amount of molasses, if desired, over the mixture before baking. 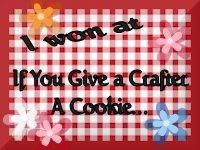 Still sounds good to me, and I've been baking all afternoon. I don't need to tell you how wonderful my house smells. Mmmmm, ahhhh, yes! I'm guessing in this day and age, you could substitute chocolate chips for the grated baking chocolate (8 ounces would be 1 cup), and you could probably use margarine instead of butter. Grammy would never have used any substitute for butter but then, she grew up on a farm where they churned their own butter. I'm not sure how big a "medium" size baking pan is but I know she used a rectangular pan, not a square cake pan, so I'm guessing about 13" x 9", give or take. If you try this receipe, and love the cookie bars as much as I did, leave me a comment and let me know. 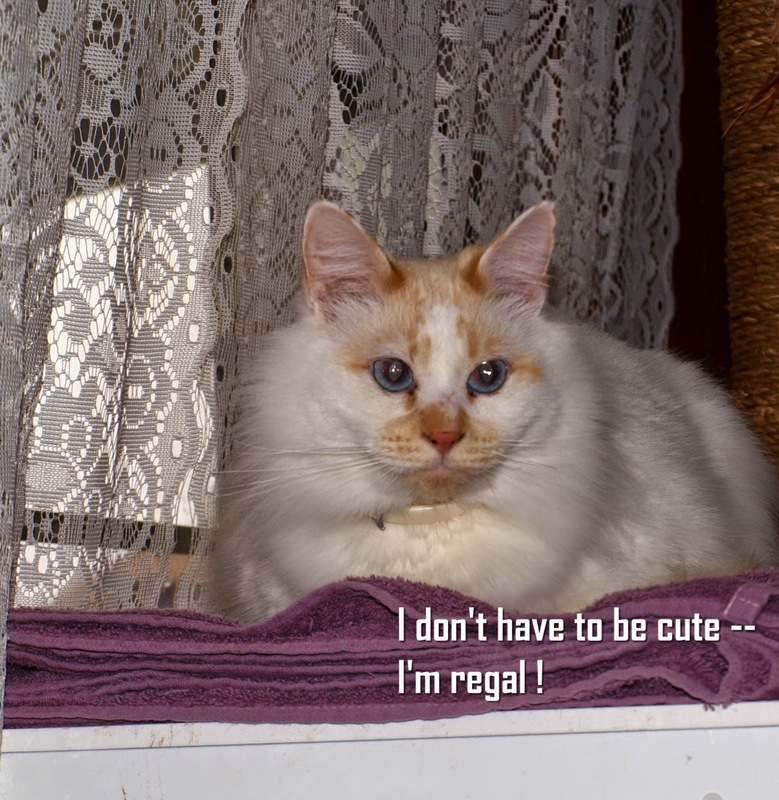 One last note, posted by one of my fur babies. My New Year's Resolution was to get a blog up and running this year and it's only February! HOORAY!! 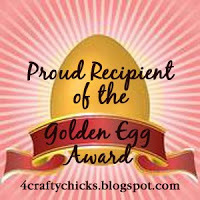 This is my first day blogging, and I want to share with you why my Blog is named "Grammy's Attic." When I was a young child, I loved visiting my grandma. She was always baking something in the kitchen, and always had a hug for us as soon as we walked in the door. The grandkids' play area was the whole attic, up a narrow set of stairs that opened into a completely open space nearly as big as the whole house. The two best places in the attic were the 'trunk corner' and the spot right over the kitchen where we could smell the cookies baking. The 'trunk corner' is where Grammy stored all things old and wonderful: dress up clothes, hats, a hand mirror, an old phonograph complete with records, boxes of stationary, buttons and laces, keepsakes from her own childhood, hand carved toys, and photographs. It was a delicious array of "goodies" -- there for touching, reading, seeing, trying on, or even smelling in the case of the old perfume bottles! Whenever I am in one of my 'crafty' modes, as I dig into my various stashes for just the right embellishment, I find myself thinking about those "attic days" of childhood. I want to share some of my projects with fellow enthusiasts, and I hope perhaps you can get a feel for the hours of joy spent in Grammy's Attic. If you're not familiar with OWH (http://www.owhstarsandstamps.org/ ), they're a great organization that takes handmade cards sent to them by people just like us who love to make cards, and they send them to military folks who are away from home so that they can write a few lines and then mail the cards off to their loved-ones. Since my eldest grandson serves in the Marine Corp., this is a cause near and dear to this old Nana's heart.